Access the cheapest AVE tickets Lleida Madrid. To travel from Lleida to Madrid at speeds of over 300 kilometres per hour makes of the route Lleida to Madrid a very comfortable and fast journey, in addition to have our cheapest tickets for AVE Lleida Madrid. A good trip starts with the best tickets for AVE Lleida Madrid. Equally, for the return, AVE Madrid Lleida. Because you can book your tickets AVE Lleida - Madrid from 28,05 € and traverse the route Lleida - Madrid in only 2 hours 2 minutes, although according to our selections during the booking of tickets for AVE Lleida Madrid we can go to 124,40 € at most and at a time of movement between both locations of 2 hours 11 minutes, though the average in both variables is by an amount of 73,93 € and 2 hours 9 minutes of time to cross the required 387 Km between Lleida and Madrid. How can we match or be as near as possible of the best conditions? In other words, to get the tickets for AVE Lleida Madrid for 28,05 € and travelling in 2 hours 2 minutes since we depart from Lleida until we arrive at Madrid. patron The timetables for AVE from Lleida to Madrid on AVE schedules Lleida to Madrid. The appropriate is to choose to make the journey by AVE in Turista class, but for you to get all the information, or in case this class does not suit your wishes, inform you that the prices in economy class vary between 28,05 € and 73,80 €, and in Preferente class they do between 47,25 € and 124,40 €. Get the best offers and rates for your tickets AVE Lleida Madrid. The search for the AVE train ticket from Lleida to Madrid for the best price was made on the 03/04/2019 a las 18:22 h, it is a AVE train with departure on the 26/04/2019 a las 7:04 h and arrival on the 26/04/2019 a las 9:15 h. The price of the cheapest ticket has been 28,05 € and the cheapest rate possible for this ticket has been the Promo fare. Trenes.com issues official AVE Lleida Madrid tickets and it does totally legally as a verified and authorised travel agency by Renfe, ie if you buy a AVE Lleida Madrid ticket through our website, you only need to print the ticket or to show the bidi code sent to the mobile phone, present it at the Lleida station and get on the train you have got assigned. 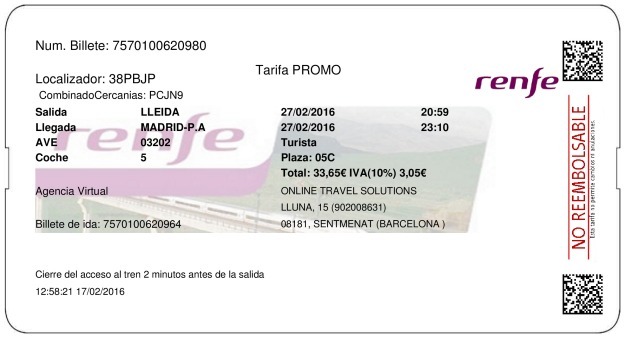 This is a real example of a Lleida Madrid ticket issued by Trenes.com. On it you can see the ticket number 7570100620980, the locator 38PBJP, the origin and destination stations, in this case the train travels from Lleida to Madrid Atocha. The railway operator Renfe, the train type AVE, the train number 03202 and the rail car 005. The contracted rate Promo in Turista class, the assigned seat 05C, the price for the ticket, this Lleida Madrid train ticket is not necessarily the cheapest ticket since the price of the train ticket often depends on the time in advance with which you bought the ticket. In this case the price is 33,60€ and the departure date is 27/02/2016. The train departure time of this ticket is at 20:59 h and the arrival of this train at the Madrid Atocha station is at 23:10 h. The duration of the journey from Lleida to Madrid Atocha has been 2 horas 11 minutos. Apart from trying to make the journey in Turista class, it is also good to book tickets AVE Lleida - Madrid for the departure at 7:04 h and do it for the journey in the ida, so we will have a travel time of approximately 2 hours 11 minutes, arriving at 9:15 h at the station at Madrid. Why should be buy on Trenes.com the tickets for AVE Lleida - Madrid? Because you have them for the average price of 73,93 €. In order to reduce the travel time, the best time is at 19:58 h, and at 22:00 h we will be arriving at Madrid, for a price of approximately 28,05 € and we will have reduced the duration of the travel by AVE Lleida to Madrid to 2 hours 2 minutes. To do new and varied things, stimulates the brain, making them in the cheapest way, stimulates the pocket, because of that, travel with our tickets AVE Lleida Madrid. It should be noted, that the first journey by AVE of the day between Lleida and Madrid you can book is at 7:04 h and the last hour in which we can book our tickets for AVE from Lleida to Madrid, is the one at 21:59 h. Whether alone or in a group, the best way to travel to Madrid is with our tickets AVE Lleida Madrid, they are the cheapest ones! The journey between the Catalan city of Lleida and the Spanish capital Madrid will only last about two hours. The trip will be a very pleasant experience, comfortable and fast. You only have to be about 15 minutes before departure at Lleida Pirineus station, get on the AVE and after finding the seat that is indicated on your ticket, enjoy all the amenities offered by the pleasant seats of the AVE. You can listen to music, read, go to the cafeteria or just relax while you watch the scenery through the window. The speed is not noticed until you arrive and you have a look at your watch. 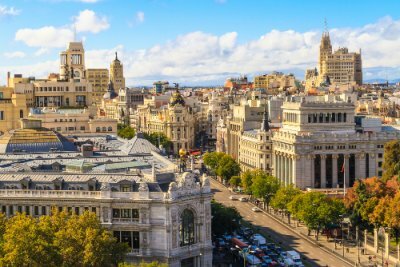 After a two-hour journey, on business or leisure, you can enjoy the city immediately, as Madrid Puerta de Atocha station leaves you in the centre of the city. Also, you can take the Metro directly and you can reach any point of the city in a short time. The railway construction is very beautiful and it was built in the 19th century (1851) by the company MZA. In 1864 an accident occurred and the station was set on fire, and in 1888 the new terminal was built and inaugurated in 1892, that is to say, after 4 years of work under the direction of Alberto de Palacio Elissagne. Elissagne collaborated with Gustave Eiffel for wrought iron work on the roof and front. Much later, in 1967, Atocha was connected by means of a tunnel with the station of Madrid Chamartín. The station of Elissagne stopped being the protagonist in 1992 when its tracks werent used anymore because the architect Moneo was in charge of adapting the station to the needs of the AVE. New tracks and platforms were needed and many more capacity, so the historic building was maintained and transformed into a vestibule of unique beauty and singularity. Where tracks used to be, we can see today an exotic garden with different species of plants and even exotic animals.